In accordance with Article 10 of the Charter, the General Assembly is empowered to discuss any question or matter within the scope of the Charter, and, subject to Article 12 of the Charter, may make recommendations to Member States or to the Security Council. In accordance with Article 11 of the Charter, the General Assembly is specifically empowered to discuss any question or matter relating to the maintenance of international peace and security which is brought before it by a State or by the Security Council, and, except as provided in Article 12, may make recommendations to the State or States concerned or to the Security Council or to both. 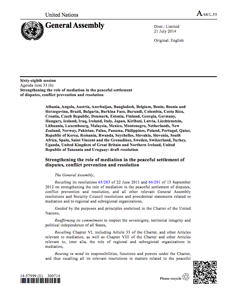 Moreover, in accordance with Article 14 of the Charter, the General Assembly can 'recommend measures for the peaceful adjustment of any other situation, regardless of origin, which it deems likely to impair the general welfare or friendly relations among nations', subject to Article 12 of the Charter. Support for the peaceful settlement of disputes has been reaffirmed in a number of General Assembly resolutions, which have helped develop a normative framework for the concept of mediation. The Manila Declaration on the Peaceful Settlement of International Disputes (annex to A/RES/37/10) reaffirmed the Charter Principle that all States shall settle their disputes by peaceful means and listed, inter-alia, negotiation, mediation and good offices as means of peaceful settlement. 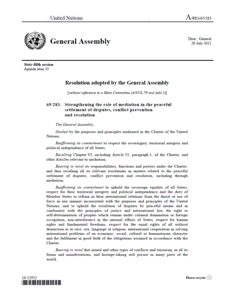 Adopted by consensus on 15 November 1982, the Declaration underlined the important role of the General Assembly in this field and stressed the need for it to effectively discharge its responsibilities. 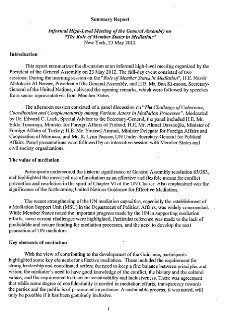 In July 2011, the General Assembly adopted by consensus its first resolution specifically on mediation. The landmark resolution entitled "Strengthening the role of mediation in the Peaceful Settlement of Disputes, Conflict Prevention and Resolution" (A/RES/65/283) recognized the increased use of mediation, reflected on current challenges facing the international community in such mediation efforts and called on key actors to develop their mediation capacities. With the increasing interest of Member States in the provisions of Chapter VI of the Charter, the President of the 66th Session of the General Assembly identified the 'peaceful settlement of disputes' as one of the four key areas for the session of the General Assembly. The theme 'the role of mediation in the settlement of disputes' was suggested for the General Debate in September 2011. During the 66th Session, events were organized by the President of the General Assembly to promote mediation and collect the experiences of the international community on the matter. These events included an informal meeting on 'United Nations Mediation: Experiences and Reflections from the field' on 9 November 2011 and an informal high-level meeting on 'The Role of Member States in Mediation' on 23 May 2012. As requested in General Assembly resolution 65/283, the Secretary-General prepared a report on the resolution’s implementation, including, as an annex, the United Nations Guidance for Effective Mediation (A/66/811). On 13 September 2012, the Secretary-General presented the report to Member States and the General Assembly adopted a further resolution (A/RES/66/291) taking note of the Secretary-General’s report and encouraging the use of the United Nations Guidance for Effective Mediation by all relevant actors. Furthermore, the General Assembly decided to continue its consideration of mediation on a biannual basis. The Group of Friends of Mediation co-chaired by Finland and Turkey has since initiated subsequent resolutions, see more info. Summary Report: Informal Meeting of the General Assembly on "UN Mediation Experiences and Reflections from the Field"
A/RES/37/10. Manila Declaration on the Peaceful Settlement of Disputes.